"It is easy to confuse our priorities. We have a duty to secure the physical safety and well-being of our children. However, some parents place undue priority on temporal and material possessions. Some are far less diligent in their efforts to immerse their children in the gospel of Jesus Christ. (See Joseph Fielding Smith, Take Heed to Yourselves! p. 221.) 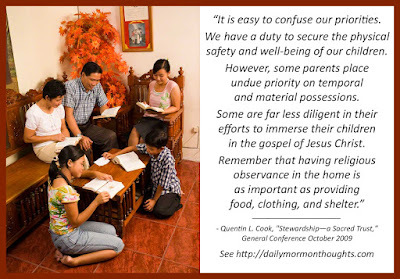 Remember that having religious observance in the home is as important as providing food, clothing, and shelter. "Parents can also help children discover and develop their talents. We are responsible for the talents we have received. Children who are not taught that they are accountable for their time and talents are increasingly subject to the foolishness and unrighteousness that are so pervasive in the world. (See Mark 7:20–23.) The family proclamation warns that individuals 'who fail to fulfill family responsibilities will one day stand accountable before God.' ('The Family: A Proclamation to the World,' Ensign, Nov. 1995, 102)"
This statement rings very true to me: "It is easy to confuse our priorities." Perhaps one of the more difficult choices we make in life is that of deciding what matters most to us, and what can be delayed or left behind. We don't always know all the implications of our choices in advance, making the choosing of priorities even more challenging. 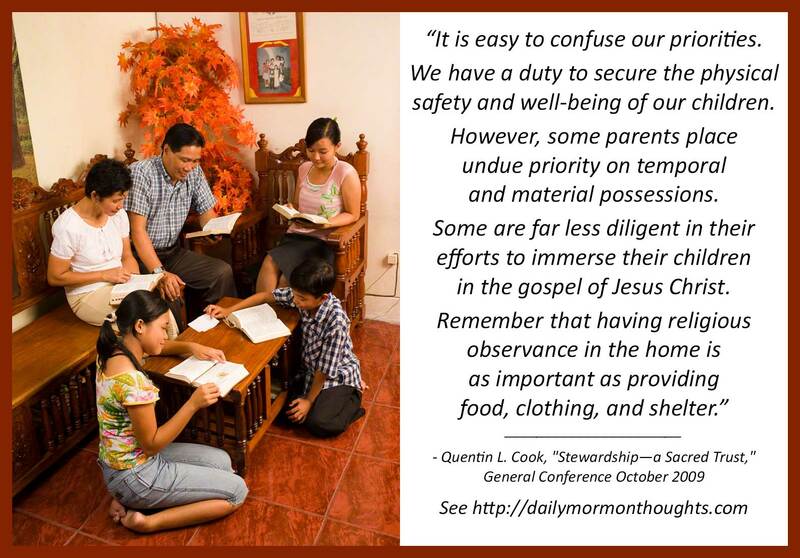 But applied to the family situation, Elder Cook helps identify a particularly timely challenge. It's important for parents to be concerned about "the physical safety and well-being" of children. But we sometimes confuse that requirement, placing "undue priority on temporal and material possessions" and neglecting far more important needs of spiritual training and protection. That's an interesting concept, "immersing" our children in the Savior's gospel. They should be surrounded and encompassed by its teachings and principles in order to be properly protected in the world! 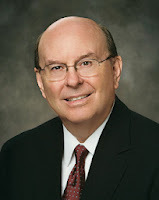 Elder Cook goes on to discuss a further priority, that of helping children explore and expand talents and make proper use of time. Setting children on a good path in these areas will bless their lives and protect them from "the foolishness and unrighteousness that are so pervasive in the world" in using time and talents inappropriately.